[corrections] It is Devils’ Advocate’s utmost goal and value to report truth in a fair and balanced way. With that said, we want to correct information that had been reported in the February story Student Interns Wanted. First, Mrs. Karen Russo was not the first to introduce the program to Central. It was a class here prior to her being employed at Central. Second, grading for the course goes as follows: Research Paper is 20 percent, Hours & Journals is 35 percent, Mentor assessment is 25 percent, Application, Interview, and Public Speaking Exercise is 10 percent and other mandatory paperwork is 10 percent. Third, Russo found mentors and internships for the students interviewed in the article. Finally, salaries are not a part of the internship program. MISSION STATEMENT Devils’ Advocate seeks to provide an open and diverse forum created by and for students from Hinsdale Central. 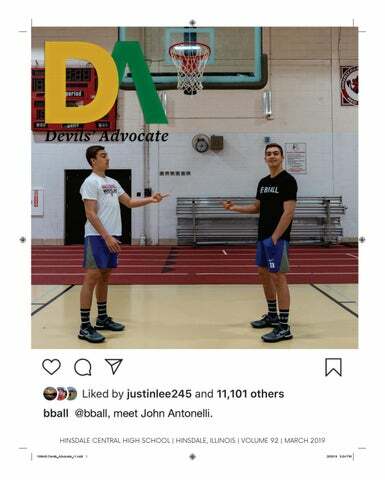 The staff of Devils’ Advocate aims to bring news to the community of the school and surrounding area, by working with students, parents, and faculty, as well as reporting on events in a fair and balanced manner. The publication strives to inform, educate, and improve the atmosphere and student body by sharing information and recognizing individuals and ideas. March brings to mind Spring Break, March Madness and of course, the April referendum looming over our heads. In this issue, we continue to explore the impact of the D86 referendum on our community, examining both the “Vote Yes” and “Vote No” campaigns to look at their opposing viewpoints. On a more student-focused note, we profile “social-media influencers” within our school—students who use use social media platforms to build a following by posting about their passions, whether it be poetry, basketball, or comics. With Spring Break quickly approaching, we analyze senior Spring Break habits, involving trips to places such as Punta Cana and Mexico, as well as the risks involved. We also look at the phenomenon of “fad diets,” which are popular diets on social media that encourage extreme dieting compared to a healthy lifestyle. We critique the lack of equality between physical education classes, such as Group Fitness classes being taught self-defense and shown a video about risk reduction and sexual assault, none of which is a part of the curriculum of other PE classes, such as F.I.T.S. 2. Finally, our Devil in Disguise goes undercover and investigates Poetry Club in light of their recent record-breaking success, and our adventure columnist goes roller skating to recapture a sense of nostalgia from a new perspective. We hope you enjoy this issue. would take up a week’s worth of curriculum at most and could be implemented, if not in PE classes, then in other core courses, similar to the implementation of Social Emotional Learning last year. “It could be taught in health classes, especially since they already talk about healthy relationships there,” said Kayleigh Excell, junior. We need to educate young students on how not to be bystanders in bad situations, as well as on how to openly listen to victims. This debrief session would open up a healthy dialogue between Central students of both genders about sexual harassment and assault. Furthermore, we need to offer SelfDefense classes to both genders as well. If those classes cannot be taught within the school, due to the lack of availability of R.A.D. certified teachers, we need to find and offer other avenues to learn Self-Defense for any students who may want to. As the documentary pointed out, sexual assault is not just unique to women, and being able to defend oneself is a skill all young adults should have. “Everyone deserves to know those skills since anyone can be a victim,” said Sarah Kim, senior. “Sexual assault is not a gendered crime.” As of right now, Group Fitness classes are grateful for the opportunity to learn about and practice Self-Defense; however, as a school, we need to step up into the future, where double standards don’t exist and every student nationwide is aware of the troubling reality of sexual assault. This editorial is the consensus of the Devils’ Advocate editorial board. k DEAN DEBLOIS STARRING JAY BARUCHEL, AMERICA FERRERA /CATE BLANCHETT. A REVIEW BY CAM GARBER. and beautiful. Special mention needs to go to the environmental effects, which represent some of the greatest attention to detail exhibited in any animated film. Whether Toothless is dancing around on the beach, slicing through clouds, or gliding against the surface of the water, the animated particles behave just as they would in real life and further realizes the setting of the series. “The animation was great,” Doyle said. “There’s a scene when they were in the forest and the grass looked insanely good, and the beach scene had great looking sand.” The biggest, and perhaps only, flaw of this movie is its rather predictable plot. Any twists and turns that the film undergoes were so heavily foreshadowed that the end result becomes incredibly obvious even before the film reaches that particular moment. This results in much of the film, particularly the ending, feeling somewhat uneventful. “[This film] didn’t get dark like the last Harry Potter movies, but I think it’s natural that they ended it the way they did,” Shen said. “It was inevitable for the ending to this franchise to be melancholic, but on the whole the tone was mostly comedic.” Overall, this film, and the entire series for that matter, is a wonderful showcase of how entertainment that is aimed towards children can transcend its target audience andtellastorythatiscompelling to anyone, no matter their age. Better Education. Better Student Experience. At The Lowest Price. Now in Hinsdale 7 N. Grant St.
Juniors Esha Modi and Rima Rafiq go rollerskating at the Lomabrd Roller Rink over the weekend. in school too; if you do poorly on a test or a project, don’t let that stop you from trying the next time. There is always room for improvement, even when it may not seem like it. And while I probably wouldn’t go back to the rink soon, it was really nice to try something outside of my usual scope. In an article by The New York Times, author John Tierney discusses the benefits of revisiting old memories with new memories. In fact, nostalgia has been proven to counteract boredom, loneliness, and anxiety. Reminiscing over things that made us happy in our childhood or our pasts can be helpful regarding your mental and physical health. At Central, you could try a club like video game club or something else that you used to spend your time doing in childhood. While it can certainly be weird to revisit old times, you might enjoy it and implement it into your current life. Rediscovering an old passion or hobby is never a bad thing and can be a great escape from school. There are tons of great indoor activities like rollerblading that have popped up all over our area in the past few years. In addition, other types of skating have become very popular. Ice skating is a common one because you can experience the feeling of skating in Millenium Park without the cold. For example, Downers Grove (indoor) Ice Arena is the perfect place for this. In terms of the Lombard Roller Rink, admission is around $8, with an additional rate of $4 to rent skates or blades. If you want to try something convenient and interesting, put on some skates and give it a try. The nurses fill out ‘paperwork’ on their iPads for the Blood Drive. reality, it takes a lot of time and thought.” The Live Day of Art concluded the department’s celebration of Art Education Week. Beginning on Monday, with the decoration of their hallway in the theme of Bob Ross, the department hosted several events showcasing the importance of creativity. “We believe that...making art [is] a wonderful complement to [the] academic preparation that we [offer] at Hinsdale Central,” said Laura Milas, Art Department Chair. “It’s fun and teaches students about themselves. That’s why we celebrate Youth Art Month.” Other events during Youth Art Month included a showcase of the work of Central alumnus Tony Moy, an illustrator, and a lesson by two videographers who encouraged students to play around with their software, teaching them about shooting film and editing. By the week’s end, the junior and senior artists of the department were ready to show off their own abilities. Senior Jackie Tu works on her artwork during Live Day of Art on March 8. DEVIL IN DISGUISE An outsider’s perspective on the inner workings of a different club every month. The Poetry Club’s competitive team performed at Louder Than A Bomb on Sunday, March 3 at Columbia College in Chicago. Pictured left to right: Seniors Maylani Sapaula, Soledad Sapuala, Kristal Moseley, Amani Mryan, John Lo, and Ayana Otokiti. poetry festival in the world. It’s hosted here in Chicago every year. “It’s my favorite solely because you get to hear so many different types of stories because you’ve got kids from all over the place,” Otokiti said. This year, poetry club has made it all the way to the finals, for the first time in the school’s history. The final round of competition took place on March 17 at the Auditorium Theater. To many though, it is not about the competitions but as growing as a writer and providing a safe space within school. “We’re the home for outsiders. Anyone who doesn’t fit the ideal model of what being a Hinsdale Central student means is welcome. It’s a safe space for anyone looking for a break from the Hinsdale stereotypes,” Mryan said. Physical Therapy. Now available without a prescription. *Per federal guidelines, beneficiaries of federally funded plans are not eligible for free assessments. In part two of A Deal with the Devil, we explored the issue of the April Referendum from the perspective of Hinsdale South’s community. Hornet students of all ages commented on their projections for the upcoming vote and speculated on the reasoning behind November’s failure, citing everything from asking amounts to unequal budgets. Surveys taken of the two schools compared student opinions on the quality of facilities, participation in eliminated extracurriculars, and overall support for the previous Referendum. With less than a month before the April elections left, in this month’s article we will explore the campaign efforts of the Vote Yes and Vote No initiatives. egardless of season, the streets of Hinsdale include festive decor. In autumn, fiery wreaths adorn the doors of every house. By spring, pastelcolored flower beds bloom from their manicured lawns. Even when the skies are grey and the hydrangeas long since blanketed with snow, holiday decorations of angels and inflatable Santas brighten up the local scenery. As the district has approached April, however, its lawns have seen an unexpected addition. Taking a walk, even just around the block, it’s impossible to miss the one thing many yards now has in common: a campaign sign. Both the November and April referendums have garnered their share of support and disapproval from the District 86 community. Since the plan was first put on the ballot in early 2018, local campaigns for each side have made varied efforts to educate the public on their respective arguments. Those who aim to pass the referendum established the Save Our Schools campaign, while those opposed to it created the Do Better D86 campaign. Throughout the past year, both sides have conducted numerous activities to bring Hinsdale residents on their page including question and answer sessions, door to door campaigning, and social media. As the April 2 vote approaches, the presence on both sides continues to grow. Based on your well scheduled spring break plans and well thought out itinerary, fourth quarter will be your best one yet. You already have a system in place to start strong and end even stronger and this year will be no different. Half of your mind is set for fun in the sun, but you are still very focused on the fact that second semester finals are coming up. You tried really hard on third quarter so you can relax (but only a little) over break. Your mind is more at ease anyway when you know your grades are good. You may bring your laptop, some school reading books and a few study guides to look through on the beach, but no one needs to know. Your spring break is just relaxing enough to catch a breath from your stressful life. You tried your best to round out third quarter on a good note, but you didn’t completely succeed at that. Although your third quarter was mediocre, you are known to finesse your semester grade in the end. Right now, you’re ready to catch up on some sleep and rest your head. You will redeem yourself next quarter, but for now it’s fun times and tan lines.